Many parts of the country are just emerging from one of the most severe winters in recent memory. The volume of snow and extreme cold has been more than a nuisance; it has indirectly contributed to increased damage to concrete surfaces. The harsh weather resulted in greater use of ice melt chemicals on our roads and walkways. In fact, the volume of ice melt usage was so great that many municipalities and retail stores were unable to maintain sufficient inventory for the increased demand. And although ice melt chemicals are necessary to ensure our safe footing and driving, they do cause damage to our driveways, sidewalks and walkways. Each application of an ice melt chemical creates an artificial freeze/thaw cycle as it melts snow and ice, creating water that is eventually absorbed into concrete where it refreezes. As water freezes it expands, damaging concrete surfaces with scaling, spalling and surface delamination. Highly absorptive aggregates or "chert" are particularly susceptible to freeze/thaw damage as they soak up the melt water created by ice melt chemicals, freeze and expand, creating readily identifiable "pop outs" at the substrate surface. Ice melts that contain chlorides can damage concrete by promoting carbonation, or "chalking". Chlorides also migrate to structural rebar, causing corrosion that can delaminate a layer of concrete and create a "pot hole". 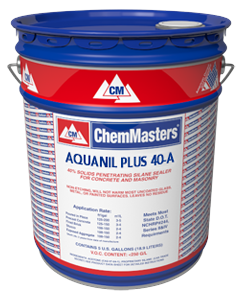 Penetrating silanes or siloxane water repellents create an effective barrier to the damaging effects of ice melts and chlorides. As a result of the severe winter and high consumption of ice melts, damage may be more prevalent this year than most. 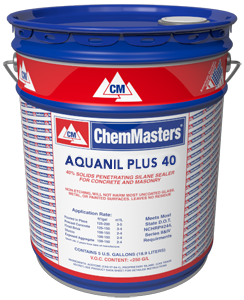 Use of a penetrating silane or siloxane water repellent such as Aquanil Plus 40, Aquanil Plus 40-A or Spall Guard WB 10% creates an effective barrier to the damaging effects of ice melts and chlorides. Concrete has a very high compressive strength, but relatively low tensile strength (typically 1/10th its compressive strength). As a result, it is particularly susceptible to freeze/thaw damage, particularly during its first winter. The less "mature" concrete is before that first winter, the greater the chance it will suffer freeze/thaw damage. 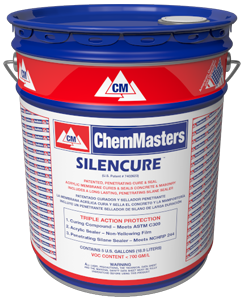 Using a product like Silencure-A or Silencure SRT to cure and protect late season pours will help prevent freeze/thaw damage during that critical first winter. "Whitening" or "frosting" is a sign that sealer has delaminated due to excess moisture and/or excess sealer. Accumulating moisture under excess sealer can cause a weak layer of concrete paste to disbond. Even as winter recedes, spring weather presents challenges of its own. Melting snow, spring rains and higher water tables mean your concrete is constantly wicking moisture from the ground. Because concrete is porous, this water passes through in the form of water vapor, which may overwhelm the Moisture Vapor Transmission (MVT) or "breathability" of a film forming sealer. Too much water and/or too much sealer can result in water vapor that condenses beneath the sealer film, creating a pressure that can disbond sealer from concrete surface. This phenomenon is often referred to as "whitening" or "frosting" due to its appearance. 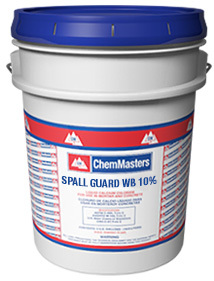 In severe cases, the accumulating moisture will create enough pressure to disbond a weak layer of concrete paste, appearing as scaling or spalling. Some spring weather is so wet that any coating will be overwhelmed by the volume of moisture passing through concrete. In fact, some local geology creates areas that are always wet, or have an excess of ground water. In those cases it may be advisable to consider use of a fully breathable penetrating sealer rather than a film former. Spring weather also presents unique challenges to water based sealers, which are vulnerable to low temperatures and high humidity. These water based products undergo a process of film formation known as "coalescence". As water evaporates, discrete acrylic molecules come together (coalesce) to form a film. But in order to do so, they require a minimum energy in the form of temperature (50° F / 10° C). That energy is both a function of ambient air temperature, and substrate temperature. In the spring it’s common to reach daytime highs in excess of 50° F (10° C), with nighttime temperatures considerably lower. Soil and concrete within the ground, require a lot of time and energy to warm up. As a result, slab on grade concrete generally takes much longer than you think to achieve adequate temperature for a water based product. "Blushing" or a milky appearance within the coating due to incomplete film formation. An incompletely coalesced film may often be repaired by use of a xylene wash within the first 48 hours. Complete lack of film formation, in which discrete acrylic particles never coalesce. They simply dry on the concrete surface appearing like powdered sugar. Complete lack of film formation cannot be salvaged. The surface must be swept clean and fresh coating applied. Remember, it’s not enough that a daytime high reaches 50° F (10° C). Both the air temperature and substrate temperature must be above 50° F (10° C), and remain there long enough, for water based coatings to properly cure. Stains can occur in concrete and within sealers from a variety of common sources. You may find the tannic acid from decaying leaves have left a tenacious stain. If that happens, try a good power wash. If necessary, judiciously apply a solvent like xylene or acetone on the stain and wipe with a clean, white, lint-free cloth to remove the stain. Afterward, apply a thin coat of sealer over the area if necessary. Ordinary lawn and garden chemicals such as fertilizers can stain concrete and sealers. The same goes for automotive products such as gasoline, greases, oils, fluids and cleaning products. Be careful when using them to avoid contact with your concrete. Quickly clean any accidental exposures. As the snows recede, spring both reveals damage to concrete and sealers, and begins a host of new sources for damage. Choosing the right high quality sealing product will improve the appearance of your concrete and help protect your investment throughout the year. 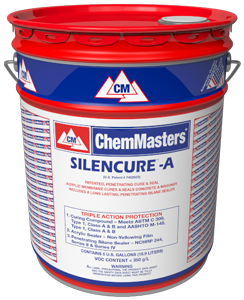 Silencure™ is a solvent-based, pure acrylic copolymer curing and sealing compound for concrete. 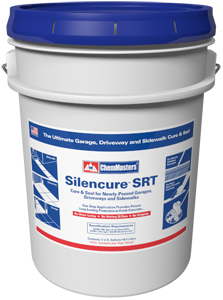 Silencure™ SRT is a patented pure acrylic copolymer curing and sealing compound for new concrete installations.